One thing I love about living in the Midwest again is that every change of seasons brings back a flood of memories. Waking up to daylight glowing behind a window shade and the coos of morning doves -- that's definitely summer vacation in grade school when every day felt like a lazy Sunday. (Thanks for not scheduling my summer days up, Mom and Dad.) Driving down the street with sun filtering through the fresh green of new leaves on the trees. Mmm. Now the 17-year cicadas are coming out later this month. People are dreading it, but I'm kind of looking forward to it. I can't really understand why these bugs only come out every 17 years -- yes, I understand that they have a long life cycle underground and it takes 17 years for them to get to this point, but why isn't there a new crop every year? But I've already traced back my life to 17 years ago, and I can in fact remember what I was doing last time I heard a million cicadas croaking in the trees. I was camping out in the parking lot of the Renaissance Faire, by the artificial lake. Watching an incredible veil of stars above us, slapping mosquitoes, talking, talking, talking. Feeling a wild trill of freedom at being able to stay away from home all night long. Sixteen years old, feeling that the main part of my life was right at that moment. It was, in the sense that the main part of your life is always happening to you. I never would have imagined that this would be my life the next time the cicadas came around: Stay-at-home mother whose main creative outlet is writing a diary that strangers and friends read on a computer network. Ha! Who could have imagined that? But I think -- or hope -- that the 16-year-old me wouldn't be too disappointed looking in on the 33-year-old me. Yes, my life is a lot more mundane than I had hoped for. Isn't everyone's? But I've written and I'm writing, and that's something that has always been important to me. I love my life, ditto. I still feel unconventional, despite the very ordinary trappings of my life. I hope that I'm raising two new individuals to shun the ordinary in their own lives. Bring it on, cicadas. I'm sure there are more buried memories that will bubble up when I hear that sound, and I can't wait to have them. Hi Tessence, this is what I learned in my entomology class; most cicadas come out every year. Many scientists believe that they 17-year cicadas have evolved to do so as a two-fold strategy against predators; by having a larval stage many times that of any potential predators, no animal can eke out a living specializing on eating cicadas, and thus can not successfully co-evolve with them. Also, when they come out in swarms they share the burden of predation; the more cicadas there are swarming, the smaller the per-capita chance of being eaten. I love hearing all insects during summer nights, and find it so very relaxing. You sound very pleased with being a stay-at home mother. 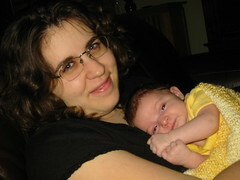 Reading this blog has made me realize what a gratifying job full-time mother is. As a 20-year old, I think I would be very proud of myself at the stage of your my life where you are. Living in the northeast, I never knew about cicadas. And thank god. Two years ago the 17-year-cicadas hit the DC area. What you saw was me, bobbing and weaving like a maniac, screaming down the sidewalk. I know the 48-year-old me will look back at the 31-year-old me and think, "What a moron." I live in the midwest and can never get enough of that cicada sound. Honestly, I had no idea there were 17 year cicadas. I guess I have something to look forward to this year! You go, girlfriend! You are, by far, the most un-ordinary mom I've ever met. Keep it up, weirdo.